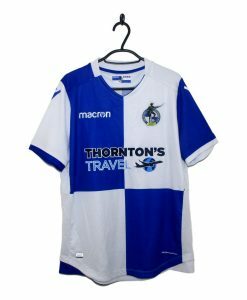 Details: Felt Bristol Rovers logo, Le Coq Sportif logo and shirt sponsor. 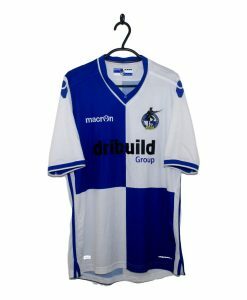 The 1995-96 Bristol Rovers Home Shirt is made up of blue and white quarters. Both the Le Coq Sportif logo on the right breast and the Elite Hampers shirt sponsor are coloured blue and white.